The Chapel of St Sebastian is located in the village of Fontainhas of Goa. 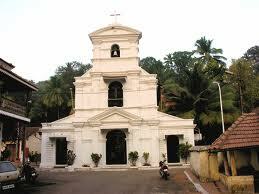 This chapel built in 1880s is a very popular tourist place in Goa. The chapel has been elevated as a church in the past few years. The Chapel of St Sebastian has gained popularity due to its crucifix of Christ, which is believed to be magical. A crucifix is a three dimensional cross with the representation of Jesus's body. The crucifix here shows Christ with his eyes open. This crucifix was originally located at the Palace of Inquisition in Velha Goa. St Sebastian Chapel is also known as Pandava Chapel. The reason for such a strange name is that the chapel is situated in the vicinity of ancient caves where the Pandavas are believed to have stayed during their visit to the Place.